The definition of “history” is the past considered as a whole. So until last week, the Hotel Sterling wasn’t “history”, it was actively part of the present. The Hotel Sterling was still a “verb” in our community. This is what I find myself contemplating: Considering that since 1964 the building had seriously declined way past the point where it was even being used as a hotel, which historical version of the building were historians and preservationists trying to “sell” to us as part of our collective history? And, more importantly, whose history were they actually telling with that version? Are there more people alive today, who have experienced the Hotel in the way that its history was being packaged for consumption, or do the majority of Luzerne County residents who are still alive, have a much different, and more important, history to recall about the Hotel Sterling? 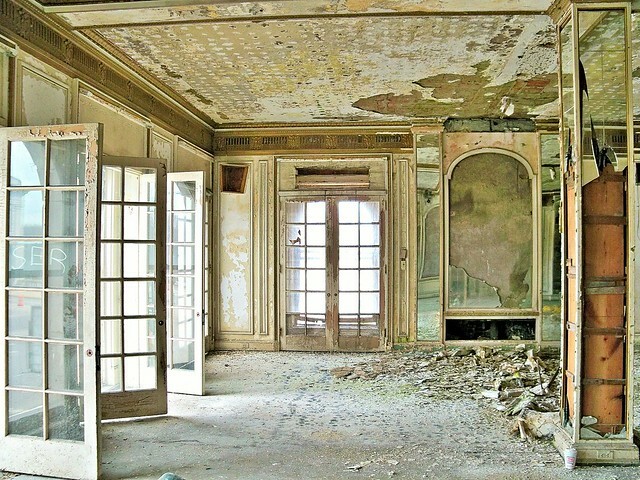 To me, as an Urban Explorer, documenting the fallout from the financial decline of our community, it represents something MUCH different than a fancy Grand Luxury Hotel where people used to dine in The Palm Room, and dance the night away in the ballroom. To most people in Generation X, Generation Y and whatever generation we are at now, the decrepit Hotel Sterling has never been anything close to that vision for them either. In fact, for more than HALF of the years in the “life” of the Hotel Sterling, it looked NOTHING like the image that preservation proponents were trying to spoon-feed to the public. 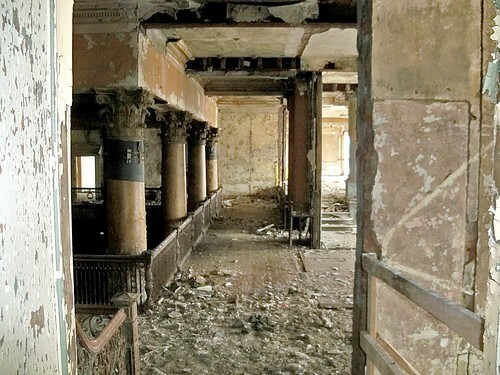 For the majority of her years as a part of Luzerne County’s history, the Hotel Sterling was not THAT hotel being portrayed by preservationists—that “history” is only true for the years occurring between 1897 and 1949, which is only 52, of the Hotel Sterling’s 116 years, as a part of the Luzerne County community. Then from 1949 to the day demolition began, 64 YEARS LATER, the reality is that the Sterling existed as a downgraded, community-centric version of its former self, until it eventually declined to the point of existing as a mold infested, water damaged, hunk of derelict, community resource pillaging, real estate for the last few generations of Luzerne County residents to experience in the physical form. How do you really interpret “collective history” when everyone’s experience, even of the physically present, can be so vastly different? How do you ultimately decide whose “history” is most important to consider, and what gets to be documented, remembered and revered? Whose story gets to be told—the living or the dead? The rich or the poor? The young or the old? And how long is it OK to put off creating the history of the future, in order to attempt to save the history of the past? I take real issue with people trying to sell any community on an historical preservation attempt that may not necessarily be in their best financial interest, based upon the assertion that buildings somehow ARE the heart and soul of that community. Buildings and institutions are often more exclusionary in nature, than inclusive. And I don’t mean that these places openly segregate community members in an overt fashion. I’m talking about the kind of subtle socioeconomic based exclusion, that often goes unacknowledged by the people doing the excluding, but is felt at a core level by those being excluded. Obviously, the more affluent classes had wider access to the Hotel Sterling during its prime years as a Grand Luxury Hotel. It was ultimately constructed strictly for the purpose of meeting the needs of the elite and business classes, while they were here in Luzerne County, exploiting the lower classes for profit. Working class people didn’t have the financial or social privilege of accessing that “string orchestra/Lobster Thermidor” version of the Hotel Sterling nearly as often as the wealthy got to have it. The coal miners, for example, with their dirty clothing and soot covered faces couldn’t belly up to the bar on their way home from work, to throw back a few beers, next to the same kind of people who were exploiting them for profit. Sure as the “Grand” version of the Hotel began to slowly devolve, it became more inclusive to a larger portion of the Luzerne County community, as a venue for social club meetings and high school graduations. More people of a different class structure began mingling at the bar. And as the decline to eventual abandonment continued, the now decrepit Hotel Sterling became low income housing for the elderly, including some of those coal miners. But much like the version of the Hotel Sterling that they lived in then, the retired coal miners were also slowly dying, because of the now diseased lungs that were inflicted upon them, as they worked for the people for whom the very Hotel Sterling was constructed, for use as a Grand Luxury Hotel, and then cast aside, like the workers themselves, when no longer useful. Actually, you could make a strong argument for the fact that the Hotel Sterling has robbed Generation X and Generation Y , of their own shot at experiencing a “Grand Luxury” version of their community and their future, because a blighted structure, with little hope of successful redevelopment, lingered for too long, on a prime parcel of real estate, impeding future economic growth in their hometown. THAT’S the version of history that ALL of us will recall about the Hotel Sterling, and unfortunately, it’s the history that will have the most impact upon Luzerne County’s future. My only visit to the Sterling as an 18yr old Wilkes College Freshman was to visit friends living at the Sterling as their dorm.